Make a delicious cup of espresso in less than a minute with the Nespresso C60 Pixie automatic espresso machine with bonus 50 capsule storage drawer. The Pixie can heat water to the perfect brewing temperature in 25 seconds and the 19-bar pressure pump system ensures the maximum extraction of flavor. After use, eject the used capsule into the tray that can hold up to 10 used capsules internally. The drip tray easily folds up when making a latte or cappuccino and the back lit buttons are very easy to read. This set also includes the Mind Reader “Anchor” 50 capsule storage drawer. The patent-pending heat-resistant panel means you can safely place your coffee machine directly on top of the drawer without worrying that it will eventually sag or that the heat will compromise the coffee capsules underneath. This holder is built to last with chrome handles, attention to detail, and superior materials. OVERVIEW: As a long-time coffee snob I couldn’t miss the chance to smackdown these upstart espresso wannabees. Well, more fool me. I was no match for the charms of little miss Pixie; this cheeky wench promptly staked a claim on my valuable counter space, right under the wings of old matron Silvia. BACKGROUND: I’ve had a Rancilio Silvia V1 for over a decade. Years ago I made the popular PID modification: a computerized thermostat for superior temperature control. I’ve replaced the boiler, twice, and the steam valve. I’ve upgraded its over-pressure valve and tuned it for optimum steam pressure. I don’t just grind my own beans, I buy fair-trade single-origin 20 pound bulk bags and roast to perfection on a homemade roaster. I make at least four lattes a day, and grind through a pound of coffee a week. To be sure, the PID’ed Silvia is hardly the Rolls Royce of espresso machines, but it is the Toyota Camry: a tried and true performer; a middle-of-the road favorite. The Nespresso is the new Smart Fortwo: affordable, stylish, leading edge, versatile and fun. Sure, they’ll both get you where you want to go, but they’re not really in the same market niche. 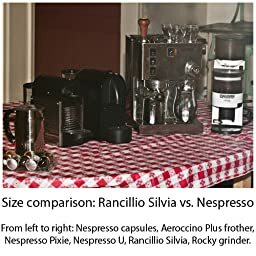 I’ve been wanting to give the Nespresso a workout for a couple years, and when Amazon Vine gave me a chance to review not one, but two models, I jumped. They are: the Nespresso Pixie (C60) and the Nespresso U (D50), both with the Aeroccino Plus milk frother. To which I added the Coffeeduck refillable capsules. What follows is a comparison of all of the above versus my old standby, Silvia. SUMMARY: For a quick and tasty single shot of espresso or small cappuccino the Aeroccino frother with the Nespresso U and Pixie do a consistently good job. Compared to my Silvia, well, I’ve made many worse cups over the years, much worse, but, after a decade of mods and mastering technique, these days I usually make better. INTRODUCTION: To start with, let me say that the Pixie and U model ranges are not Nespresso’s top-of-the-line but closer to introductory level. Their least to most expensive model ranges are as follows: essenza, U, PIXIE, citiz, lattissima and maestria. As to temperatures, warmup times, and taste, I couldn’t detect a significant difference between the U and the Pixie models, so contrasting them comes down to aesthetics and ergonomics. If I write “the Nespresso” I mean either the U or Pixie models, interchangeably. Also, when I write “cup of coffee” versus “espresso” I’m merely referring to the volume of water pushed through the pod, though a purist would rightly distinguish between a Cafe Americano and a ridiculously over-extracted espresso. Temperatures were taken with my Extech 22-816 digital multi-meter, and weights were taken with a Philips HR2394 kitchen scale. What follows is a particularly long, perhaps overlong, review. If you couldn’t care less for technical comparisons, ancillary diversions, personal opinions and supplemental recipes skip to the succinct conclusion at the end. TEMPERATURE: Some people complain Nespresso temperatures are too low, and regarding a cup of coffee it’s a fair criticism; though regarding a shot of espresso it’s wrong. A shot of espresso was usually around 175° degrees Fahrenheit (though it could range from 165° to 180° – more on that later), but a cup of coffee only reached around 155°. In comparison, my Silvia’s espresso temperature was around 165°, but as I can set the Silvia’s PID to any arbitrary temperature, that’s really only relevant as a way of saying the Nespressos are right in the ballpark for espresso. However, many people recommend coffee temperature at 155°-175°, so at 155° the Nespresso really is on the low side. The Nespresso U had the following default shot volumes: small=0.75oz, medium=1.1oz, large=3.25oz. The Nespresso Pixie had these default shot volumes: small=1.55oz, and large=3.5oz (no medium button). I say “default” shot volumes because both models are easy to reprogram. And I eventually did so, practicing without a pod, until settling on 1oz single shots for the small button, and 4.5oz coffee cups for the large. Clean, modern machine that works like a charm. Love that it leaves a small footprint–at least in terms of my counter space. Spend a few extra bucks a get the chrome finish if you have a stainless steel kitchen. The new wood finish is also quite nice. I’m really a big tea drinker, but I was so impressed by Nespresso easy to use & great tasting product I had to incorporate a bit of espresso into my life.